People are often drawn to the energy of certain crystals that they need in their lives, from birth stones to gems in jewelry. 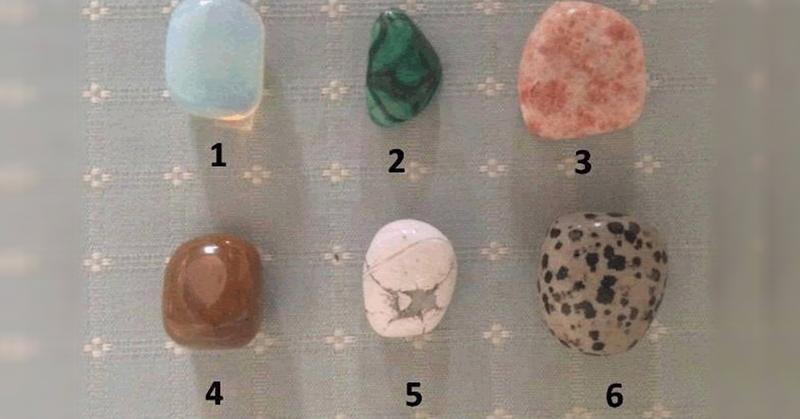 Choose the first crystal you’re attracted to in the picture and see what it means about your current situation in life. Choosing the opalite represents a thirst for freedom and a place where you can focus on your own voice. The cloudiness of this stone also shows that you are exhausted and worn out by the current dullness of your daily life. However, this does not always imply that you are troubled. It simply means that your life isn’t moving in a certain direction that you expected it to. This stone tells you to manage stress by investing some time in focusing on your own vibrations. By spending a few minutes to calm down and listen to the guidance from within your own heart, you are allowing yourself to find much needed peace and inspiration. The Green Malachite symbolizes change. Perhaps you are going through a huge transformation at the moment; it may be career-related or a lifestyle change. This crystal can also mean a more profound change. For example, spiritual development or letting go of past experiences which have been burdened by for a long period of time. The Green Malachite shows that you need to pay attention to your self-worth and that it is time to finally appreciate yourself more by beginning the sincere practice of self-compassion. This crystal is also linked to prosperity and healing, which could mean that some good luck is on its way to you. It also represents the end of an unhealthy relationship, giving you the opportunity to find someone who knows your worth and appreciates your value. If you have picked the Sun Stone, it implies that you are beginning to feel considerably more optimistic about your future. The power of the Sun is boosting your vitality, enhancing your well-being and conquering your fears as well. The Sun Stone is also related to good fortunes and it implies that your life is improving. Simply stop for a moment and envision yourself feeling happy. You feel unlimited happiness as you are surrounded by the support of your loved ones, giving you the strength you need to conquer any issue you may be facing. This is the ideal time and opportunity for positive change in your life! These stones imply that you are ready to let go on whatever negativity exists in your life, giving way to happiness and new opportunities. We are often consumed by bitter feelings, but you are steadily becoming more grateful about the beautiful things in life and letting go of what has held you down in the past. Letting go allows our purity to emerge, and starting with small daily actions of self compassion and kindness for others is what is needed now to get you to the next level in your life. The Howlite tells us that you may have been receiving signs from a higher spiritual force. It may be through your dreams or a vision, through a quiet whisper in your heart, or even through specific numbers appearing countless times throughout your day. Choosing this crystal means that you need to pay attention to these signs. Chances are, you have been having trouble sleeping as these hidden messages are constantly calling your attention. Choosing the Howlite symbolizes a new spiritual path that is guiding you to what you truly want, so follow your heart and have faith in what your deeper being is showing you. This precious stone symbolizes being fun and carefree. Picking it implies that you are finally getting some fun into your life after a time of stress and dissatisfaction. Laughter can help lighten difficult situations. It encourages us to manage issues and challenges, and it ties relatives and companions closer to us. Spend more time with those you love, and these good times will help to light-up your life in new positive ways. Next articleIf You Love Her, Don’t Destroy Her.